In Greek mythology, the hero Perseus was famous for killing Medusa, the snake-haired Gorgon whose grotesque appearance turned men to stone. This painting, however, shows a later episode from the hero's life. At Perseus's and Andromeda's wedding, their nuptials were interrupted by a mob led by Phineus, a disappointed suitor. After a fierce battle, Perseus finally triumphed by brandishing the head of Medusa and turning his opponents into stone. 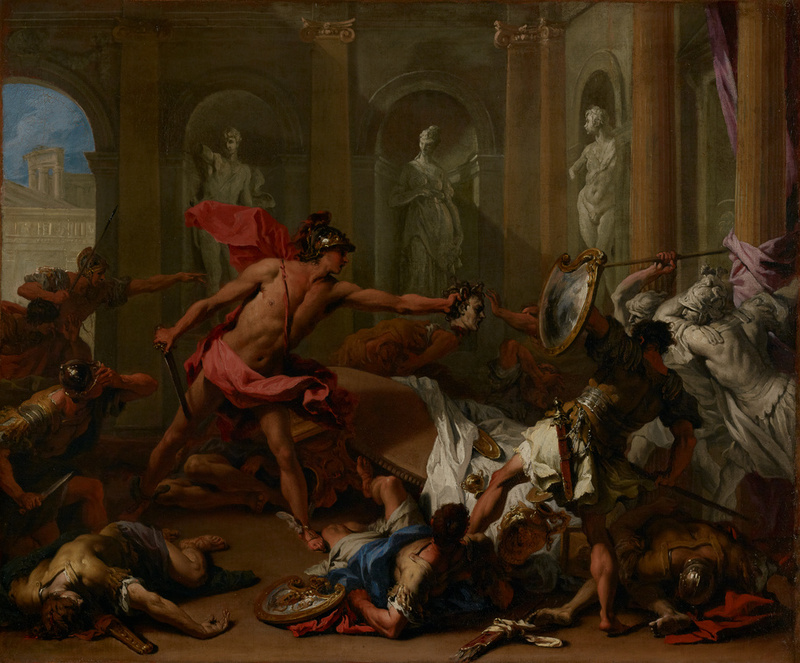 Sebastiano Ricci depicted the fight as a forceful, vigorous battle. In the center, Perseus lunges forward, his muscles taut as he shoves the head of Medusa at Phineus and his men. One man holds up a shield, trying to reflect the horrendous image and almost losing his balance. Behind him, soldiers already turned to stone are frozen in mid-attack. All around, other men have fallen and are dead or dying. Ricci used strong diagonals and active poses to suggest energetic movement. Ray Livingston Murphy, 1923 - 1953 (New York, New York), by inheritance to his mother, Ray Slater Murphy, 1953. Thomas Agnew & Sons, Ltd. (London, England), sold to the J. Paul Getty Museum, 1986. Christie’s, New York. Important Paintings by Old Masters. January 15, 1986, p. 81, no. 113, ill.
Wrey, Mark, ed. Christie's Review of the Season 1986 (Oxford: Phaidon, with Christie's, 1986), p. 21, ill. "Acquisitions/1986." The J. Paul Getty Museum Journal 15 (1987), p. 185, no. 50. Jaffé, David. Summary Catalogue of European Paintings in the J. Paul Getty Museum (Los Angeles: J. Paul Getty Museum, 1997), p. 107, ill. Le Leyzour, Philippe, and Alain Daguerre de Hureaux, eds. Les peintres du roi, 1648-1793, exh. cat. (Paris: Réunion des Musées Nationaux, 2000), pp. 140, 142, fig. 26b, under no. 26. Scarpa, Annalisa. Sebastiano Ricci (Milan: Bruno Alfieri Editore, 2006), p. 233, no. 258, pl. XXXIX, fig. 479. Students write stories describing action and publish them with illustrations in a book. Tied to Open Court unit Risks and Consequences.